Heat oven to 350°F for shiny aluminum pan, 325°F for dark nonstick pan. Place paper baking cup in each of 12 regular-size muffin cups, or grease cups with shortening or cooking spray. In medium bowl, stir together flour blend, baking powder, xanthan gum and salt; set aside. In large bowl, beat granulated sugar, 1/3 cup softened butter, peanut butter and 1 teaspoon vanilla on medium speed about 3 minutes or until light and fluffy. Add eggs, one at a time, beating on medium speed 1 minute after each addition. On low speed, beat in dry ingredient mixture alternately with 1/2 cup milk, beginning and ending with dry mixture. Divide batter evenly among muffin cups. Smooth tops of batter in cups with wet fingers. To make Chocolate Frosting, in medium bowl, beat 3 tablespoons softened butter and chocolate until blended. Add powdered sugar, 1/2 teaspoon vanilla and enough milk until smooth and spreadable. 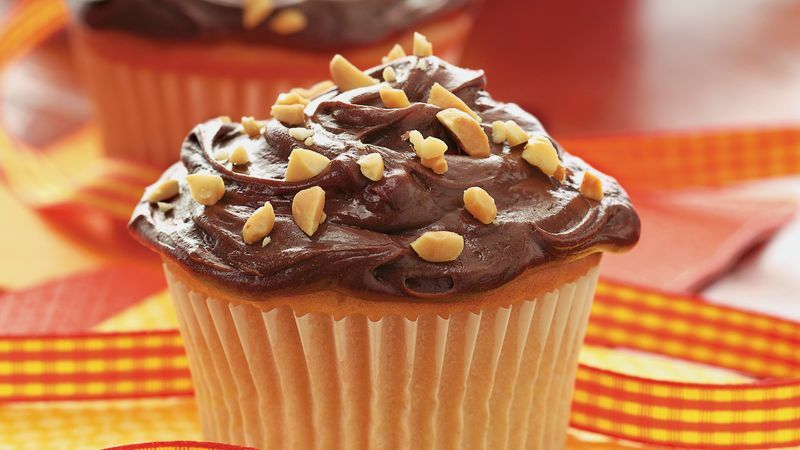 For a special treat, top each cupcake with a half of a mini gluten-free peanut butter cup.